Find out which two things these former U.S. presidents have in common! Cause of death: While he slept, a blood clot entered his lungs. -During his time at the NYPD, Roosevelt enacted sweeping reforms to the corrupt police department. Among the many changes, he standardized officer pistol usage and started the bicycle squad for officers. 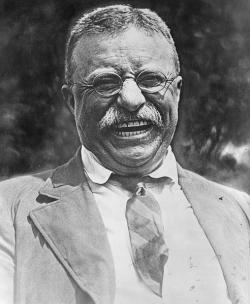 -Teddy Roosevelt started the Progressive Party. It was nicknamed the Bull Moose Party after he told reporters, "I'm as fit as a bull moose." -During an expedition in South America in 1914, Roosevelt contracted an infection from a wound on his leg. He had a fever of 103� and became so delirious that he recited the opening line from Samuel Coleridge’s "Kubla Khan." -On October 14, 1912, John Schrank shot Roosevelt in the chest with a .38 caliber revolver before Roosevelt was about to make a campaign speech. The bullet was slowed by a metal glasses case and the 50-page speech text folded over twice in his breast pocket. Roosevelt decided to go ahead with the speech, and he spoke for approximately an hour and a half before going to the hospital. The bullet was lodged between his ribs, and doctors determined that it was safer to keep the bullet there than to try to remove it. -About one year before his death, Roosevelt lost the hearing in his left ear after undergoing surgery to remove abscesses from his thigh and ears. Cause of death: He died from pneumonia that was complicated by Alzheimer's disease. -Reagan acted in films in the late 1930s to early 1940s before serving in the U.S. Army during World War II (he didn't serve overseas). 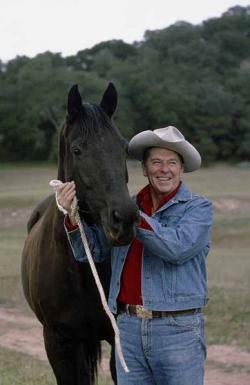 -Reagan is the only U.S. president to have been divorced. As governor of California, he signed the first no-fault divorce legislation in the U.S. called the Family Law Act. -On March 30, 1981, Reagan and three others were shot by John Hinckley, Jr. as part of a presidential assassination attempt. The bullet broke one of Reagan's ribs, punctured a lung, and caused serious internal bleeding. He underwent emergency surgery and was hospitalized for two weeks. -Reagan nominated the first female Supreme Court Justice, Sandra Day O'Connor, on July 7, 1981. -Ronald Reagan was the first U.S. president to wear hearing aids while in office to help with his difficulty hearing high-pitched sounds. He first wore one in his right ear; in 1985 he wore another in his left ear. -Bill Clinton played tenor saxophone in grade school; he made first chair in the state band's saxophone section. He considered pursuing music as a career, but decided to pursue public service instead. -Clinton is the second president in U.S. history to be impeached (the first was Andrew Johnson). -He was the first U.S. president who was a Baby Boomer. -On October 29, 1994, Francisco Duran fired shots with a semi-automatic rifle at the White House. He thought that Bill Clinton was among a group of men standing outside on the White House lawn. Clinton was actually inside of the building, no one was hurt, and Duran was sentenced to 40 years in prison for the assassination attempt. 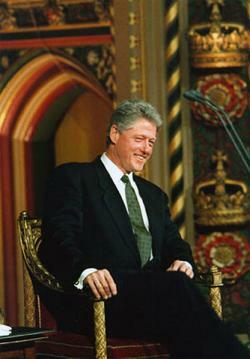 -In 1997, Clinton was diagnosed with high frequency hearing loss, and he was fitted for completely-in-canal hearing aids. Want more? Check out our list of seven famous people with hearing loss. When you first start wearing hearing aids, there&apos;s a short adjustment period. Use these tips and tricks to get used to your new devices quickly and easily.